rebounding (6.6 rebounds per game) this season. Photo courtesy of Furman. 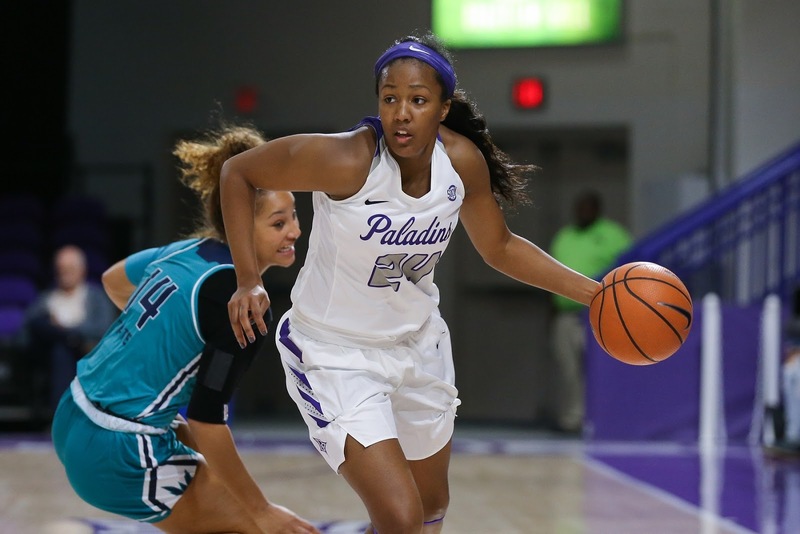 The Furman women's basketball team has overcome a couple of significant preseason injuries to get off to a hot start this season. Following it's latest win - a 93-46 victory over Bob Jones, the Paladins are 7-2 this season. Last season, Furman played the final month without one of the greatest players in school history after Whitney Bunn suffered a season-ending injury. While her career ended prematurely, Bunn still finished as the fifth-leading scorer in school history and the school's all-time leader in 3-pointers and assists. "When she went down last year, it just rocked our entire world. 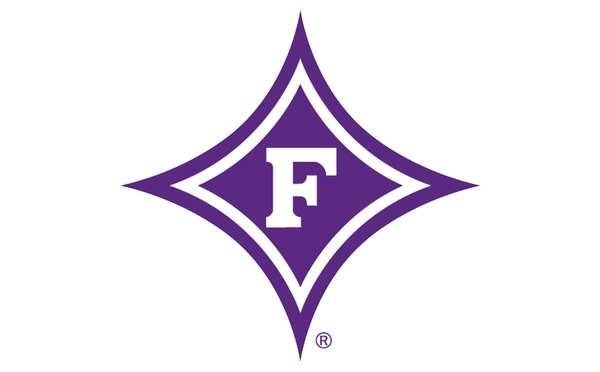 I had to learn a lot of lessons for myself as a coach - how not to put ourselves in that position and to just talk to my team about taking everything one day at a time," Furman coach Jackie Carson said. "That's how we've approached this season. We say every day in practice, 'let's be better than we were yesterday,' and we've had a lot of success doing that." Learning how to deal with Bunn's injury last year has unfortunately paid off before this season even got started. Furman lost two players expected to make major contributions in the preseason. After Tierra Hodges suffered a torn ACL, Milica Manojlovic had the same injury less than a month later. Both are out for the season. Hodges started 18 games as a freshman last season and averaged 5.6 points and 4.8 rebounds per game. Manojlovic, a freshman and native of Montenegro, was projected as Bunn's replacement at point guard this year. "It was devastating to have Baby T (Hodges) go down because she worked probably the hardest in the postseason. She took it personal when we said we needed more out of her as a leader and for her game to expand," Carson said. "Milica got hurt at our Midnight Madness (practice) and she'd been through so much already. She had just gotten cleared by the NCAA because they couldn't read her transcripts from Montenegro. Her visa got messed up, so she had to go home early for summer school. That injury's been really hard because that kid is 24 hours away from home." Carson said the injuries allowed Furman to utilize those lessons learned last season. "As disappointing as it was to lose both of them, we can't let one person or injury define what our team is going to do. It just means everyone else has to step up and that's exactly what's happened," Carson said. "Our upperclassmen have done a great job of being tremendous leaders through the adversity." Senior Cierra Carter leads Furman in scoring (14.6 points per game) and rebounding (6.6 rebounds per game). The Paladins' top outside shooter, sophomore Le'Jzae Davidson, is second on the team at 13.8 points per game. Celena Taborn is the other player in double figures at 10.4 points per game off the bench for Furman. Taborn, who's one of seven freshmen on this year's squad, also averages 5.4 rebounds per game and has pulled down 30 offensive boards. "Cierra's played the four her entire career, but this year she's our starting three. ... She's probably been in the gym more this year than she was in three years combined just trying to work on it," Carson said. "Celena's given us something we've never really had in this program. ... She's a presence who uses her body well and has tremendous hands. Our guards are confident throwing any kind of pass in there and expect her to finish." After a November schedule filled with home games, the Bob Jones game was the lone one at Timmons Arena in December. Furman begins a five-game road trip Sunday at 2 p.m. at North Carolina. The Paladins are 1-2 away from home this season, but are coming off an 80-59 win over USC Upstate in their last road game. That marked Furman's first non-conference road win since another victory over USC Upstate on Dec. 12, 2015. By the time the Paladins return to Timmons Arena, it will be a new year and time to begin Southern Conference play. Furman hosts Samford and Mercer on Jan. 4 and 6, respectively. "We have to get ready because it can't get too much tougher than Samford and Mercer coming out of the gate in conference play," Carson said. "These (road) games will be good for us."